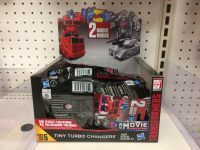 The newest Transformers Tiny Turbo Changers Series 5 has hit US retail a few days ago. Courtesy of 2005 Boards Members Nevermore and Vector Oracle we can share for you the complete list of identification codes. Tiny Turbo changers are packed in blind bags, but there’s a code embossed on the bottoms of the bag near the Hasbro logo. The code starts with a letter of the alphabet and it’s this letter that tells you who is inside.